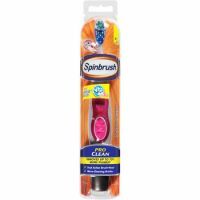 Spinbrush ProClean™ battery-powered toothbrushes feature dual-action technology. A circular oscillating head spins to clean and polish even between teeth. The secondary brush bristles move up and down to scrub away plaque and massage along the gumline.